The caribbean has already lost 80% of its coral reefs. Grand Cayman Eco Divers in collaboration with the Cayman Islands Department of Environment and various local dive establishments have teamed up for over a year aspiring to maintain coral nurseries to aid in conservation, sustainability and restoration of Cayman’s coral reefs. The program has developed effective strategies for protecting and restoring damaged areas of coral reef. 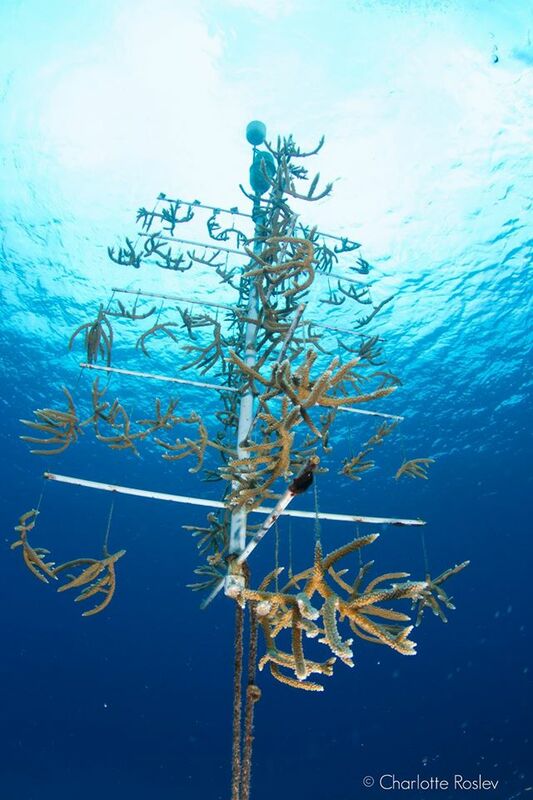 In short, their innovative approach is to grow Staghorn coral in nurseries. Coral fragments are grown on structures referred to as coral trees. These “trees” are made from PVC and fiberglass rods. The fragments of coral grow into colonies. After significant growth they are then later removed from the tree and out planted onto damaged coral reef areas to aid in their recovery. For longevity it is proven to provide a sustainable way to maintain healthy reefs. The successful transplantation and growth of the coral fragments help create diversity in the ecosystem as well as more resilient reefs. 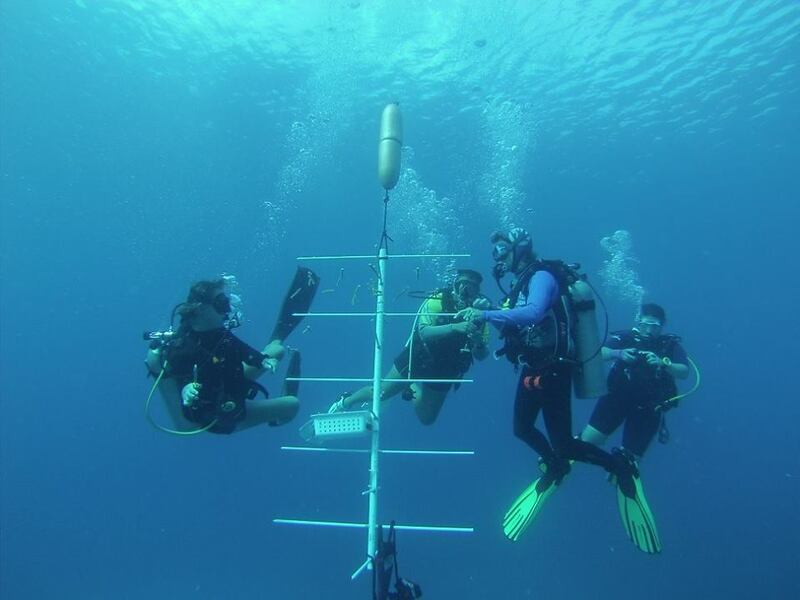 Cayman Eco Divers are seeking to expand the current Coral Nursery Program to include: data collection, research, educational study programs for both local and international students. The expansion of the already successful program will allow the symbiotic relationship between the participating dive companies and the Cayman Islands Department of Environment to monitor the growth of coral reefs, the health of the reefs and ecosystems. 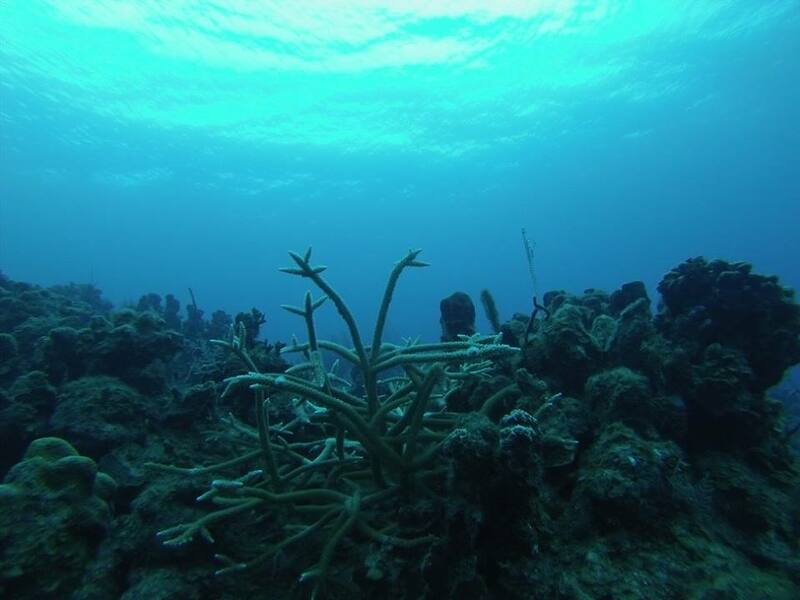 The research will focus on key areas such as: the survivability of the coral fragments, which coral genes are resistant to disease or bounce back quickly, how coral adapts to climate change issues and pressures and locating any unique new species of coral. Furthermore, the coral nurseries themselves are monitored and relevant data is collected in regard to the growth, survivability and health of the coral fragments to ensure they are healthy enough to be out planted onto critical reef areas. This united effort in collecting data will benefit our island’s efforts in conservation. Grand Cayman Eco Divers is proud to offer an educational component to their Coral Reef recovery initiative. Their study abroad program is open for applications for those interested in participating in the Coral Nursery Program. The program will provide international students with an all inclusive stay at local resorts Sunset House and Divetech as well as affordable island lodging. The educational program is offered as: a one week program, 2 week program, 4 week program and a 6 week summertime program. Students are guaranteed to have a one-of-a-kind experience allowing them to maximize their time interacting with living coral reefs, learning about conservation, coral research and monitoring local reefs and have an overall high equality experience. The Coral Nursery Program offers an opportunity for growth in ecotourism here in the Cayman Islands. Visiting divers (and local divers) have an incredible opportunity to participate in directly helping with conservation of our fragile coral reefs. Participants will learn step-by-step the process of transplanting viable coral fragments. They will also be given a full overview of the program and an educational course on conservation of coral reefs. Conservationists from all over the world can see first hand the positive impact of this beneficial program. As an island dependent on vibrant coral reefs, the Coral Nursery Program is highly valuable to both ecotourism and conservation. It promises to ensure the future of healthy local reefs and creates awareness about innovative ways of conservation for coral reefs. Initially started by Cayman Eco Divers, they have since built an alliance with the Cayman Islands Department of Environment, Sunset House, Ocean Frontiers, Divetech, Central Caribbean Marine Institute, Cayman Brac Shack. The united group collaborate to ensure the sustainability of healthy coral reefs in the Cayman Islands. 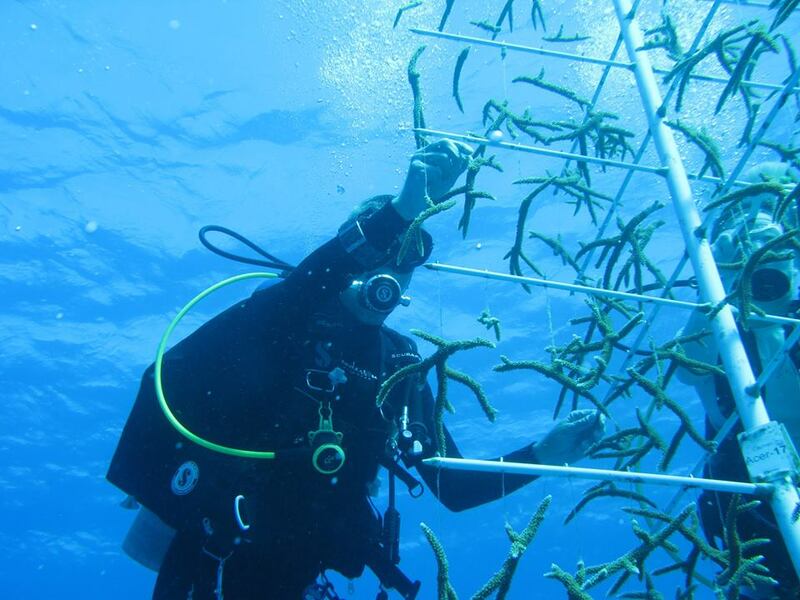 Collectively, each affiliate has started a coral tree nursery and actively participate in maintaining the nurseries and transplanting viable coral fragments onto critical reefs and ecosystems. Through their continued partnership as a united team there is hope that Cayman’s coral reefs will continue to thrive as a healthy ecosystem. If you would like to support this wonderful initiative you can donate funds to contribute to the overall success of the preservation of critical coral reefs and ecosystems.